Case 1 : A 49-year old male had been suffering pain on neck ,shoulder and left arm following a fall from steps. . .
A 49-year–old male had been suffering pain on neck ,shoulder and left arm following a fall from steps. He had taken treatment from two hospitals without much relief. Finally he came to Indoamerican Hospital. 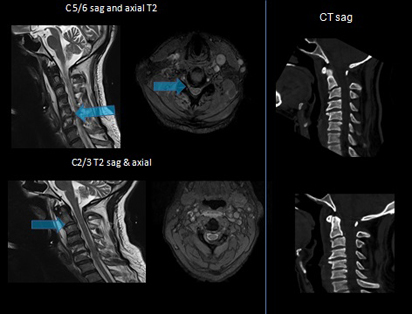 We did CT Spine & MRI Spine and found that he has hangman´s fracture with right pars interarticularis, left superior facet of C2-3 facet with C5/C6 disc prolapse causing thecal sac compression and over exiting nerve roots. Our team discussed the case and it was decided that if performed well, surgery is the best and least expensive way to treat of this condition. 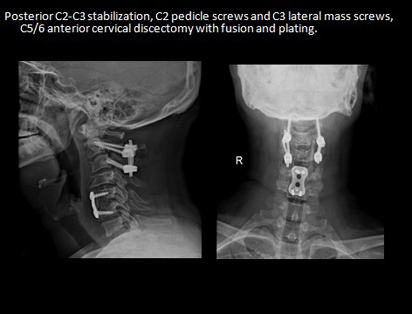 He underwent posterior C2-C3 stabilization with rods and screws and grafting followed by C5/C6 anterior cervical discectomy and fusion with right iliac crest bone grafting and plating. Post operative check, X ray showed good position of implants and graft. He was later ambulated under guidance of Physiotherapist on our Neuro rehabilitation centre. 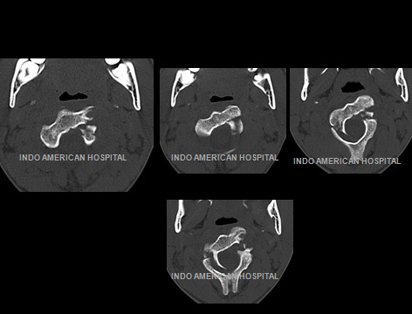 Patient was discharged after a couple of week. On the day of his discharge the patient showed happiness and gratitude for his permanent relief from pain. This 20 year old boy had suffered severe head injury and cervical spine injury following a road traffic accident at Bangalore. He was initially treated at Bangalore where he recovered from head injury. His severity of spine injury was misjudged there and hence he was discharged from hospital with a neck collar. 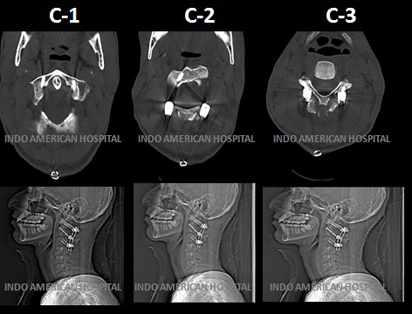 He presented to our hospital with progressive neck pain and restriction of neck movements. 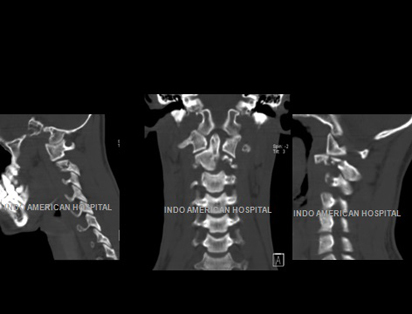 We investigated him with HRCT Spine & MRI Spine, which showed traumatic cranio-vertebral junction injury with fracture C2 pedicle and superior articular facet on left side and pars fracture on right side causing rotatory subluxation of C1 over C2 and traumatic spondylolisthesis of C2 over C3. 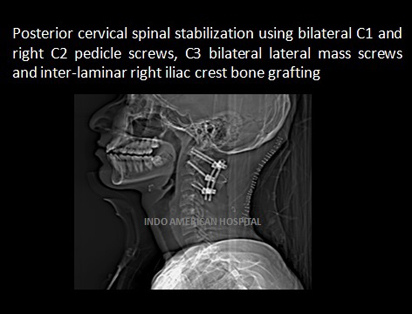 He underwent posterior cervical spinal stabilization using bilateral C1 and right C2 pedicle screws, C3 bilateral mass screws and interlaminar right iliac crest bone grafting. He was later ambulated under the guidance of physiotherapist at our Neuro rehabilitation centre. Patient was discharged after a couple of week. Now he is back to his college without any deficits.